Yarn is the twisted form of fiber. According to American Society for Testing and Material (ASTM) “A generic term for a continuous strand of textile fiber is called yarn”. Spun yarn are made by twisting together of staple fibers. Filament yarn is by the assembly of continuous filament. Monofilament yarn consists of only a single continuous thread. Multifilament yarn is made from multiple filaments. Complex/ Novelty/ Fancy yarn is the yarn which has special effects on its own appearance. 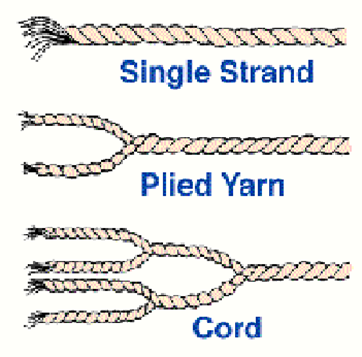 Cords are made by twisting plied yarn. 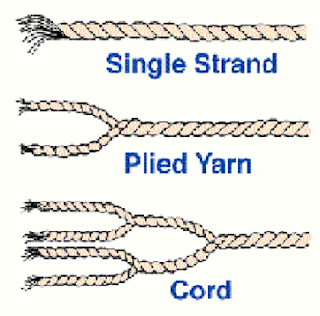 Cables are produced by plying cords. Slub yarn contains bulky/ fluffy region. Loop yarn requires a base yarn (core yarn) around which the fancy or effect yarn is wrapped.